Photovoltaics, the direct conversion of light from the sun into electricity, is an increasingly important means of distributed power generation. The SPICE modelling tool is typically used in the development of electrical and electronic circuits. When applied to the modelling of PV systems it provides a means of understanding and evaluating the performance of solar cells and systems. The majority of books currently on the market are based around discussion of the solar cell as semiconductor devices rather than as a system to be modelled and applied to real-world problems. Castaner and Silvestre provide a comprehensive treatment of PV system technology analysis. 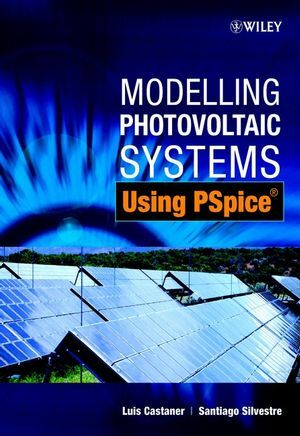 Using SPICE, the tool of choice for circuits and electronics designers, this book highlights the increasing importance of modelling techniques in the quantitative analysis of PV systems. This unique treatment presents both students and professional engineers, with the means to understand, evaluate and develop their own PV modules and systems. Luis Castañer is the author of Modelling Photovoltaic Systems Using PSpice, published by Wiley. Santiago Silvestre is the author of Modelling Photovoltaic Systems Using PSpice, published by Wiley. Introduction to Photovoltaic Systems and PSpice. Spectral Response and Short-Circuit Current. Electrical Characteristics of the Solar Cell. Solar Cell Arrays, PV Modules and PV Generators. Interfacing PV Modules to Loads and Battery Modelling. Power Conditioning and Inverter Modelling. Annex 1 PSpice Files Used in Chapter 1. Annex 2 PSpice Files Used in Chapter 2. Annex 3 PSpice Files Used in Chapter 3. Annex 4 PSpice Files Used in Chapter 4. Annex 5 PSpice Files Used in Chapter 5. Annex 6 PSpice Files Used in Chapter 6. Annex 7 PSpice Files Used in Chapter 7. Annex 8 PSpice Files Used in Chapter 8. Annex 9 PSpice Files Used in Chapter 9. Annex 10 Summary of Solar Cell Basic Theory. Annex 11 Estimation of the Radiation in an Arbitrarily Oriented Surface.